Planning is something the military are renowned for but even they don't always get it right. 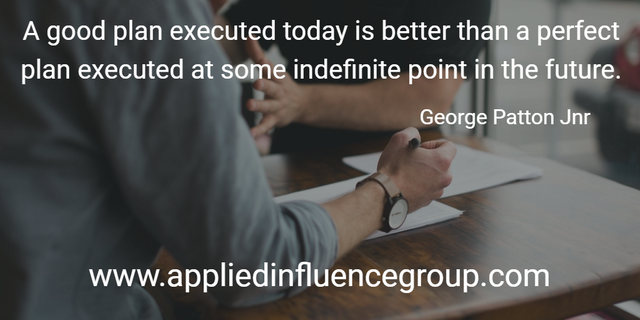 George Patton commented that "A good plan executed today is better than a perfect plan executed at some indefinite point in the future." Many people overthink planning and feel that if it doesn't involve strictly laid down formal processes then it isn't being done properly. Finding the right way to plan for you is crucial. I personally plan best when I'm running. There's something about the physical activity that separates out the different parts of my brain and makes me more effective. Planning for influence is no different. Detailed written plans will work for some people, while just consciously thinking about the next interaction you will have will be perfect for other people. What is it I hope to get out of this interaction? What do I know about the other person that is relevant to this interaction? What topics do I want to talk about? What topics do I want to avoid? How am I going to try to influence the other person? What might go wrong? What might go right?